Over the 2019 Easter weekend, Sunnybank Brass competed in the 2019 Australian National Band Championships, held in our home city of Brisbane. It was a fantastic weekend with bands from all over the country all coming to compete over the weekend. CONGRATULATIONS to Glen Warrener - Champion B Grade Drum Major! CONGRATULATIONS to the band for winning the Most Entertaining Change of Direction ($700 first place prize money coming our way.) and for winning the Street March component of the weekend - 2019 Australian National B Grade Marching Champions! We can be proud of this effort! See below for the full video of our winning Street March and Most Entertaining Change of Direction! WELL DONE everyone for being there over the weekend. For getting up on stage and doing your best. It was a huge weekend. And while we still have work to do (onwards and upwards) we can still be proud of our efforts! CONGRATULATIONS to Kelsie McCullough on her first Nationals conducting Sunnybank! We love you and are happy we were your first band to take on a Nationals stage as our conductor! 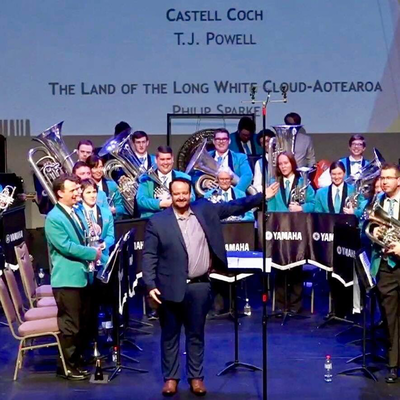 THANK YOU to Michael Purtle for driving all the way down to Brisbane to help us out on Eupho, to John Kennedy for helping us out on Cornet and Jacob Agapow for permitting and helping us out over the weekend. Thank you to Ash Retter for flying up to be on stage with us over the weekend! We will miss you in the band hall! MASSIVE THANK YOU to all of our members who volunteered over the weekend. You did Sunnybank and the brass banding community proud! MASSIVE CONGRATULATIONS to Annette Ries and her organising committee on a successful competition weekend! 2 years of hard work, commitment and dedication has paid off! You deserve a well-earned holiday soon!!! CONGRATULATIONS to Annette Ries being recognised for her many many years of service to the Australian brass banding world. Well deserved, Annette! We are so lucky and appreciative to have the amazing Annette as our band president. She truly is awe-inspiring with the dedication, commitment, passion and time she puts in to our band, the QBA and the Australian brass banding community. She truly deserves this wonderful recognition! Annette is a true brass band icon and legend! Thank you all! And HAPPY EASTER! Congratulations to our Musical Director Michael Purtle! Despite the huge preparation for our trip to Shanghai we also achieved a fantastic result at the QLD State Championships only one week after our return. Hard work, dedication, enthusiasm and passion shown by Michael is such a credit to his commitment to our band. Getting the band to produce a creditable performance on stage in spite of 'China' flu affecting much of the band was even more credible. A win in the Hymn and Test and overall B Grade winner was a surprise to everyone! Also congratulations to our Drum Major Glen Warrener who once again successfully lead us to win the 'Most Entertaining Evolution' and 'Overall' B Grade marching champions! A huge achievement by Glen after such a busy lead up program. The band had an rare opportunity this year to showcase our talents to a local Shanghai audience of 300,000 and a television audience of 200 million! Invited to attended the 29th annual Shanghai Tourism Festival 2018 the band embarked on an exciting and fulfilling journey with many rehearsals and final participation in the Grand Opening Parade along Huaihai Rd Shanghai. Our participation along with many other international acts from around the globe was a truly festive one and an amazing spectacle. The band also performed concerts at local shopping centre and at the famous 468 meter Oriental Pearl TV Tower. A formal invitation to the 'welcome banquet' was greatly received where formal greeting of all the participating groups was recognised. The band completed its visit to Shanghai with several cultural experiences and visits to several places of interest.